Greetings! We are closed on Friday, December 22, 2017 due to preparations for our annual Christmas Party. Instead, we will see you at the Great Eastern Hotel for the celebration! Makati branch will be open on Saturday, December 23, 2017 at 2PM – 6PM only. In observance of the Philippine national holiday Bonifacio Day, the American Institute for English Proficiency will be closed on November 30, 2017; Thursday. Our classes will resume regular schedule on December 1, 2017; Friday; 11am-8pm. 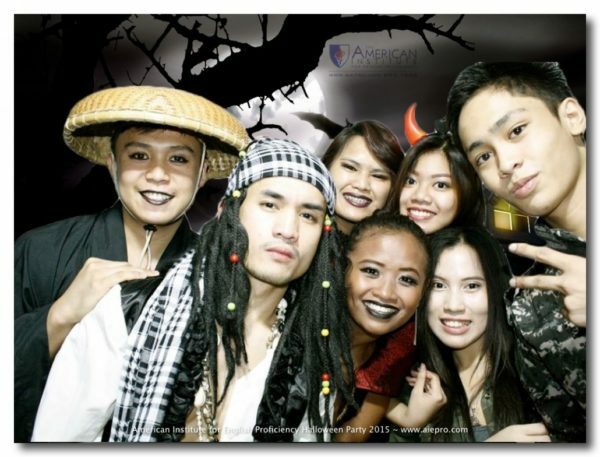 What to bring: Casual and corporate attire (as many as you can), sports and events costumes. 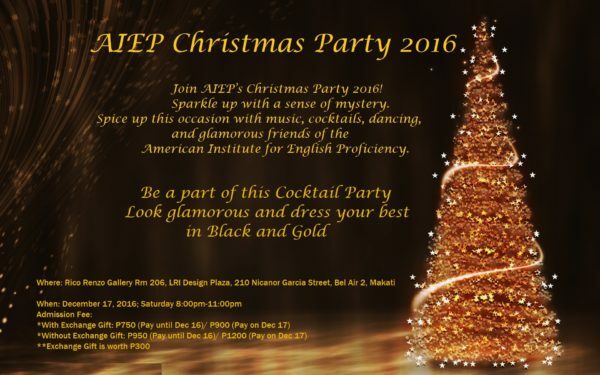 The American Institute for English Proficiency is closed on July 5, 2017, Wednesday at both branches in Makati City and Quezon City. 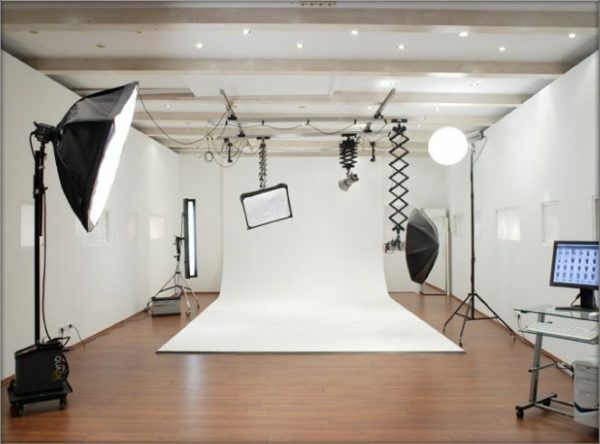 We are in the process of enhancement to serve you better and ensure quality English training for our clients. Our regular operations and classes resumes on July 6, 2017, Thursday, at 11:00 am. Due to company recalibration we will be closed on May 2, 2017, Tuesday. We will resume regular operations and classes on May 3, 2017, Wednesday, 11:00am. If you have further questions, you may contact admin support at 0917 841 2437 or 0917 844 2437. 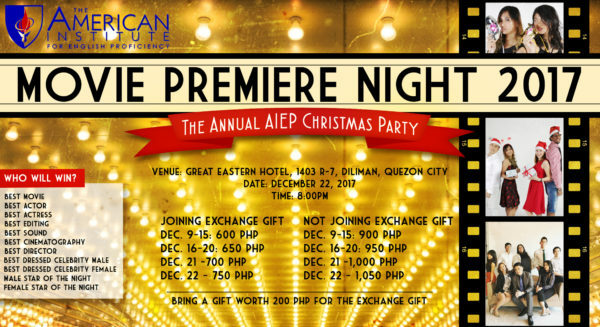 You may also send us an email at inquiry@aiepro.org. Thank you and have a great day. In observance of the Eid Al-Ahda 2017, we are closed on April 28, 2017, Friday. Our regular operation resumes on April 29, 2017, Saturday for both Makati and Quezon City. 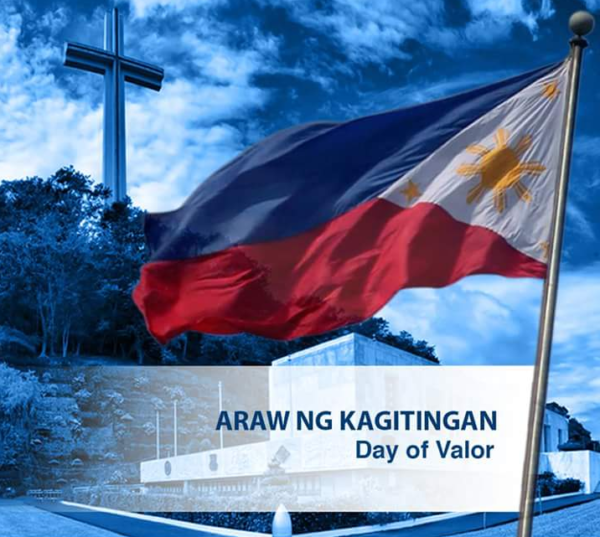 To commemorate the Day of Valor, a Philippine national holiday, we are closed on April 9, 2017, Sunday as we will celebrate the bravery of our soldiers and dedication to serve our country. Our regular classes will resume on April 10, 2017, Monday at 10am. 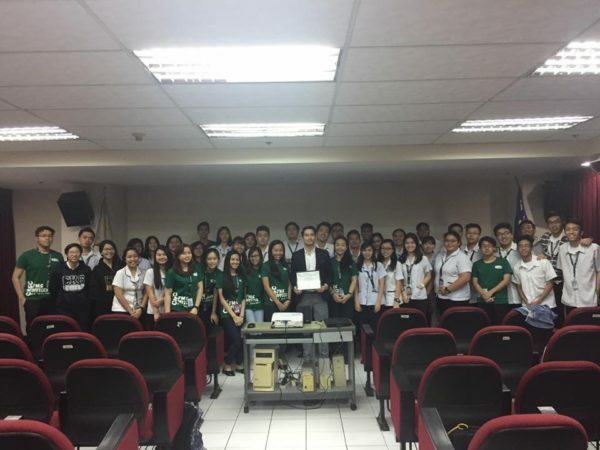 For inquiries, please contact our admin support at 09178442437 or 09178412437; you may also send us an email at inquiry@aiepro.org. In observance of the Philippine national holiday Bonifacio Day, the American Institute for English Proficiency will be closed on November 30, 2016; Wednesday. Our classes will resume regular schedule on December 1, 2016; Thursday; 10am-8pm. 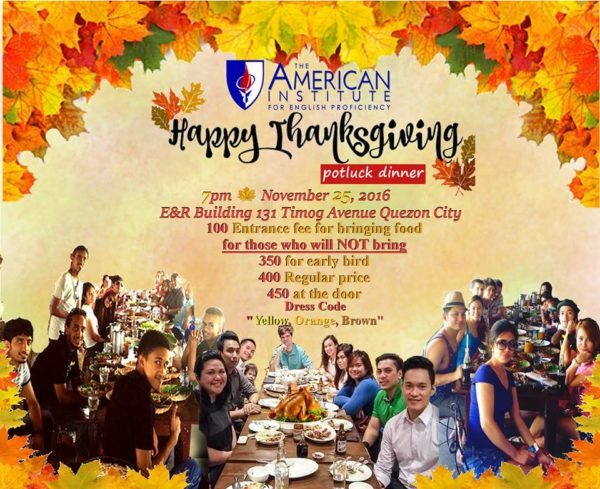 Celebrate the season of Thanksgiving with the friends and family of the American Institute for English Proficiency. It is the time to give thanks to all the great things that has happened to us this year: health, home, love, family, friends, food. 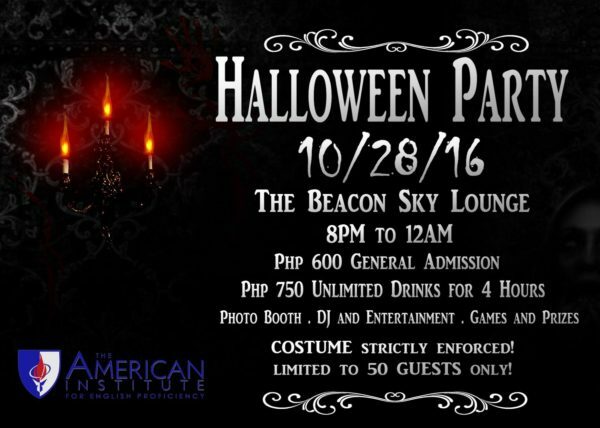 Join us as we celebrate AIEP’s ANNUAL HALLOWEEN PARTY, happening on October 28, 2016, Friday, from 8PM to 12AM, at The Beacon Sky Lounge, Chino Roces corner Arnaiz Avenue, Makati City. 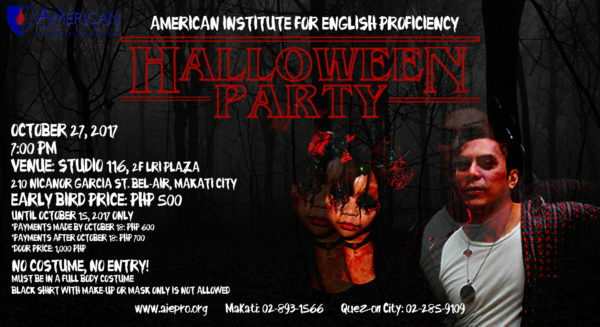 Wear your creepiest, most fantastic halloween costumes and get the chance to win free hours of class at AIEP. Hit the dance floor all night long. 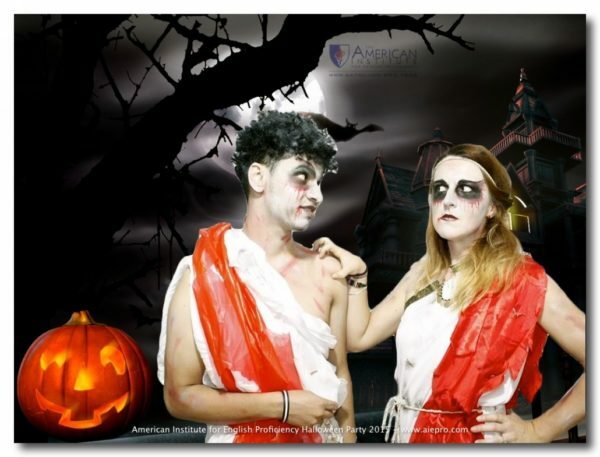 Strike a spooky pose at our photobooth. Indulge yourselves with some finger foods. 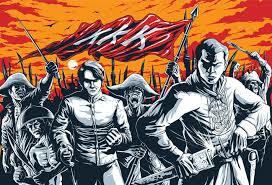 We will paint the town blood-red with an after-party at the Black Market, along Chino Roces Avenue.